Bishop James King (left) and the Revs. 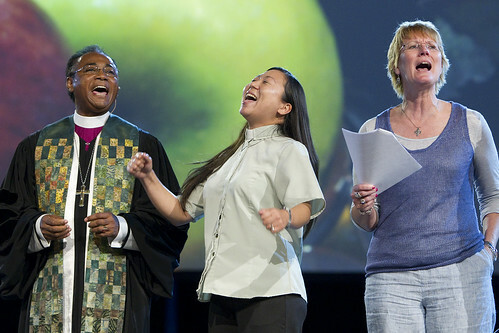 Motoe Yamada (center) and Kim Reisman sing during evening worship on April 25 at the 2012 United Methodist General Conference in Tampa, Fla. King is episcopal leader of the South Georgia Annual (regional) Conference. Reisman is a delegate from the Indiana Conference, while Yamada is a reserve delegate from the California-Nevada Conference. A UMNS photo by Mike DuBose. Click on image to enlarge.View more photos. After an intense plenary session that included the report of the Call to Action committee, a much-welcomed evening service was ushered in by General Conference worship director Marcia McFee. "What are the things you need to let go of to hear Jesus Christ more clearly?" she asked those attending in person and online as the conference moved into the event closing the first full day of the April 24-May 4 meeting in Tampa, Fla.
Full of pageantry and symbolism, a dance of hospitality and a song and prayer of thanksgiving helped usher delegates and General Conference attendees into a state of worship on April 25. The Unity Praise Team from Valley Faith United Methodist Church in Sunnyvale, Calif., and Creation Dance Production from Genesis United Methodist Church in San Jose, Calif., joined the General Conference worship team to lead the service. After readings from Isaiah 55:1-5 and Mark 2:13-17, Bishop James R. King, Jr., episcopal leader of the South Georgia Annual (regional) Conference, greeted the General Conference session with his trademark, "Hello, beautiful people!" Bringing energy and enthusiasm to the crowd, King preached a message of inclusion, invitation and love. "The doors to the Kingdom of God are wide open," he began. "Once we're in, it's our job to invite others in." Too many United Methodist churches sit almost empty, he said. There are many reasons for the lack of vitality and growth, but the answer is simple. "There is no shortage of people in the world, but there is a shortage of love." As people of faith, he preached, the potential is great and the possibilities are limitless because God's harvest is plentiful. King challenged believers of every nationality, every race and every language to heed Jesus' call to "make disciples of all nations." "Invite in sign language, invite in English, invite in French, invite in German, invite in Korean, invite in Portuguese, invite in Russian, invite in Spanish, invite in Swahili," King admonished while naming the languages into which the General Conference sessions are being simultaneously translated. Recounting Levi's calling into ministry as told in Mark 2, King said that Jesus saw Levi - a tax collector - and said to him, "Follow me." "Hear this message," he said. "All means all." As United Methodists, he asked, how many times have Christians heard the saying, "Christ invites all, all to his table?" "We invite the Levis of the world because we understand that all means all," he said. The paralytic who was lowered into the house from the roof by his friends, Levi the tax collector, David the shepherd boy - all were outsiders who were brought in by the love of Christ, King continued. "Jesus claimed the blind, the prostitute, the poor, a thief on a cross," he said. "Outside, but brought in. Why? Because all means all. All means all!" Loving others changes the world. Centering on Jesus' commandment to love others, King urged his United Methodist congregants to focus on their mission to love. "If we forget the mission, it's easy to forget the people," he said to applause. "Like the Pharisees, we can replace people with rules and laws. If we do, our Discipline will get thicker while our membership declines." The key to remembering the mission, he said, is to write it down, make it plain, teach it, practice it and make it a holy habit. "We will destroy what we do not understand." The action point of the message is to apply the Golden Rule with every person. "It's simple but it works," Bishop King said. "Do unto others as you would have them do unto you. If you apply this rule, it will change your behavior. It will change the local church. It will change the annual conference. It will change The United Methodist Church &ellipsis; and yes, it will transform the world. "Beautiful people - love works!" Reminding attendees and thousands of online viewers that Jesus said to "go and make disciples of all nations," King asked if they were going to follow Jesus' commandment. "If your answer is 'yes,' let us go to all the corners of the world, inviting everyone into a right relationship with God through Jesus Christ. So, beautiful people, invite! Come one, come all!" *Witherow is editor of the South Georgia Advocate, official news source of the South Georgia Annual Conference.